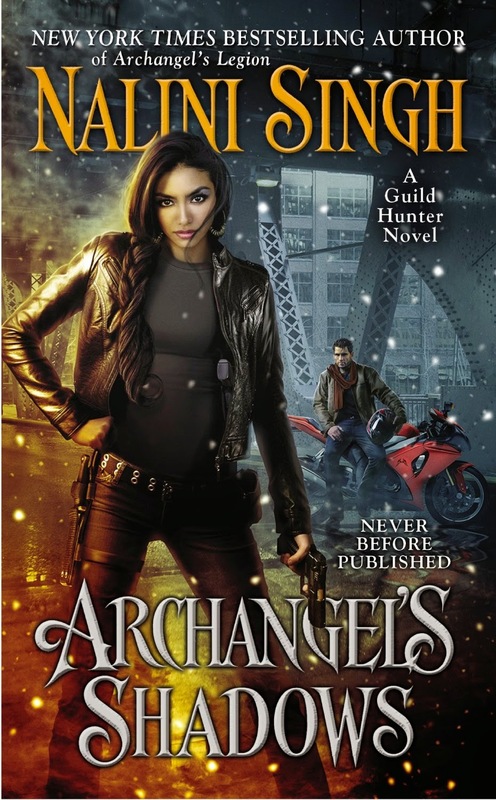 Nalini Singh first introduced readers to Guild Hunter Ashwini and Cajun vampire Janvier in the novella Angels’ Pawn. The banter and chemistry between them were fabulous, and now they have their own book, Archangel’s Shadows. Set after the horrible war depicted in Archangel’s Legion, this book reunites the pair as Ash seeks Janvier’s help resolving mysterious deaths in New York’s Vampire Quarter. Singh’s Guild Hunter series sucked me in like a vacuum cleaner, which is great on one hand but also creates a high bar for every subsequent book to clear. Archangel’s Shadows succeeds admirably. The ongoing flirtation between Ashwini and Janvier started when she was assigned to hunt him. The chemistry between them was immediate, and Janvier made a habit of annoying angels so Ash would be assigned to hunt him. It was his unique form of courtship. Unfortunately, Ash is keeping a lethal secret, one that stops her from going forward in the relationship--despite their explosive chemistry. She also has a talent that makes touch risky, one Janvier and a very few others understand. When a new drug for vampires generates widespread bloodlust and corpses turn up that have been not only fed upon by vampires but somehow mummified, Ash and Janvier work together to solve the problem. The proximity of working on the case forces Ash to confront her fears about the relationship. But she dreads what will happen when Janvier knows the truth. Archangel’s Shadows centers on the relationship between these two but also includes peeks at couples from earlier books, especially hunter-turned-immortal angel Elena and her consort, Raphael, the Archangel of New York. The story also touches on angelic politics in the aftermath of the recent war, in which Janvier and Ash fought together behind the lines, without losing its focus on the romance. The writing, as expected, was clear and skillful, and the story moved quickly. Overall, five stars. Thanks for the review, Nancy! I have yet to read one of Nalini's books. Blame it on a lack of time, not interest. With enthusiastic recommendations from you, Buffie and others, I know I need to move them up my reading list. Do you recommend reading the series in order or can I jump in anywhere without being lost? unfortunately, you do need to read them in order, mainly b/c there are series arcs that definitely affect the characters. And, seeing Elena and Raphael's relationship mature and grow :) They are the main series "couple" and make appearances in every book.If you want to "try" Nalini Singh's paranormals w/out committing to a series, you can try her Psy/Changeling series. Those can be read out of order for the most part. They are romance centered and boy do they deliver! Nancy, great review. I have not read any if his author's work, but see her name a lot around the web. I usually don't read this kind of story unless I know the author. I will keep t on my maybe to read list. I know I really should give it a try. Have this one on the Kindle right now to read. I've like Ash and Janvier ever since Angel's Pawn and a few appearances here and there in the series, happy to finally get their story. I definitely` recommend Nalni Singh, love both series, though Psy/Changeling my favorite of the two. I would say though that the Psy series is better read in order, too; though each book has its own romance couple, there is still an ongoing plot line that definitely adds to the series for me. I read a piece by her in an anthology and really liked her style. I have not read any of her Guild Hunter series, but it sounds like I had better correct that. I have only sampled paranormal and urban fantasy, and am amazed at the wide variety of characters and worlds. It is hard to know what direction to go in.